Hey guys….so in case you didn’t know…it’s 17 days until Thanksgiving. That mean’s it’s 17 days until the kids are out of school, the crazy uncle is in town…17 days until some very important questions are answered: who is cooking what and who’s eating where and is everyone going to get along???? 17 days until your kitchen is jam-packed with all the delicious foods of the season (if I’m being incredibly honest here, it’s really only about 14 days until that happens). Along with all the comfort and joy and excitement of the Thanksgiving/Christmas season, there comes a fear….looming….like a stormcloud. The fear is this: The scale. Can I get a witness, in particular, from you other new mamas out there? I mean, dang. I really didn’t gain too much weight when I was pregnant. I didn’t give into crazy cravings. I exercised frequently. The official, healthy recommendation is between 20-30 pounds, and I very consciously stayed within that. If you read forums, people say-“Oh if you are healthy and gain the right amount, it will just fall off naturally soon after baby.” Might be true for some people, but definitely not for me. I lost about 12 pounds total (including the 7 pound baby) by the first week postpartum and then…nothing at all. And it’s not because I’m breastfeeding or not breastfeeding (That’s another blog post). Anyway, I’ve still got between 10-15 extra pounds hanging onto my body for dear life despite healthy eating and daily exercise. I realize that’s not a ton in terms of baby-weight, but for someone who has been trying as hard as I have and who teaches fitness classes, it’s been extremely frustrating. So, all of this to say that I’m feeling the need to get my metabolism revved up a bit before the holidays are here. I don’t want to add to my own frustration…Since I’ve got 17 days before the Master of All Cheat Meals is here, I’m turning to a method I’ve used before to cleanse and lose a few pounds: The 17 Day Diet. 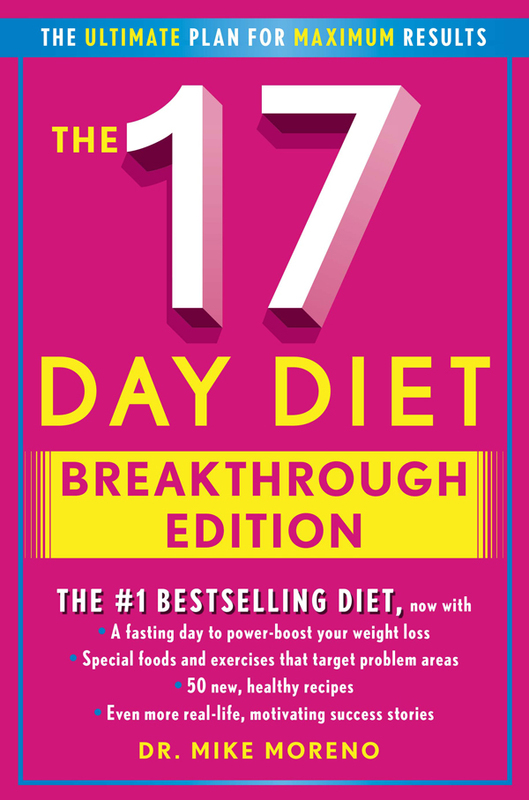 The 17 Day Diet is a book that was written in 2011 by Dr. Mike Moreno. It’s got three phrases-or “cycles” and each is 17 days long. The diet is essentially focused on lean proteins, pro-biotics and cleansing vegetables. It also allows some fruit (2x before 2 p.m.) and, in cycles 2 and 3, complex carbohydrates. I’m a big fan of “diets” like this one, because they aren’t really, “diets” -just eating healthy and avoiding the bad stuff (I also like Trim Healthy Mama for the same reason..which is what I’ve been doing largely to eat healthy-I just haven’t lost on it). The 17 Day Diet focuses a lot on eating frequently,drinking more water (and healthful teas) and avoiding items that stress your system out (alcohol, caffeine, sugar). Last time I did it, I lost weight quickly, felt good and found myself not craving carbs after the first several days. Cycle 1 is the stage that is supposed to help you detox off of sugar, flush off water weight (and a little real weight) and get your metabolism revved up. Last time I did this cycle, I lost several pounds in 17 days. It’s definitely the strictest cycle, so it helps if you can do it with somebody. My husband has lovingly agreed to support me by eating Cycle 1 friendly dinners. The trick to this method of eating (and, I dare say, any diet) is to not get hungry and to keep lots of on-plan foods stocked in the fridge. 17 days gives me just enough time to complete Cycle 1 by Thanksgiving. Hopefully, this will help me make better choices on the holiday and be motivated enough to get back on track between Thanksgiving and Christmas for Cycle 2. The way I see it..one cheat day on the actual holiday won’t hurt anything…but two months of holiday munching? That’s the real nemesis. Of course, that’s easier said then done….so I’m sharing with you for the selfish reason of accountability. I’ll check in periodically on how this is going…maybe some meal plans or shopping lists, if you are interested. I’m hoping, but not counting on, this helping me begin to lose those 10-15 pounds (with my hormones, metabolism…whatever…being in this rut)..but I do know it will help me avoid the 7-10 that the media claims the average American gains during the holiday season… And that sounds ok to me. So here’s to the holidays, living healthier and feeling better about ourselves! Are you doing anything to battle the seasonal bulge?